This quote has left me thinking quite a bit the past few weeks. Am I driven to financial success by a hope for financial independence? Or am I driven there out of a fear of being back in the financial hole that I was in during 2006? I think both elements are present. I don’t want to be back in 2006 in any way (other than maybe to enjoy my oldest son as a baby again for a little while… he was a very quiet and cuddly baby). At the same time, I think about the big goals almost constantly. So, yeah, fear is a real component here. Does it guide me? I can’t say it doesn’t, but I can say it’s not my only guidance. Did you know that you’re 13 times more likely to laugh if you’re with somebody else than if you’re alone? Cognitive neuroscientist Sophie Scott shares this and other surprising facts about laughter in this fast-paced, action-packed and, yes, hilarious dash through the science of the topic. It feels really good to laugh. Laughter is one of the best parts of my life – few things feel better than a really good laugh, at least to me. This talk points out that such a response is actually completely normal. Laughter has a positive effect on our minds and our bodies that’s basically impossible to replicate with medications or other activities. Not only did this video make me laugh, the science in it reinforced my commitment to making sure I laugh at least a few times a day. This quote brings a great deal of peace to me. It reminds me that the routine of things is what truly matters. If you have a solid routine, it does not matter what the future brings to you. If you have a solid routine, that routine does nothing more than leave you feeling joyful at the end of the day and able to wake up tomorrow and have that same routine available to you once again. For me, frugality brings that kind of peace. Spending quality time with my family brings that kind of peace. Writing brings that kind of peace. Taking care of things around the house in a thoughtful way brings that kind of peace. Exercise brings that kind of peace. If a day has those things in it, I can go to bed knowing that today was a good day, and I can also feel good knowing that when I get up tomorrow, I can have that same kind of day again. The end of the world or the end of my life in the near future doesn’t change that. There is a big difference between living for the moment and living in the moment. This is going to sound absolutely crazy when I describe it. Coffitivity is a website that streams audio to your computer that simulates the background noise one might hear in a coffee shop. I’ve been using it non-stop when working for the past several days and I’ve fallen in love with it. So, why? Why would you want this? For one, I can’t work in complete silence. I have tinnitus, which starts to ring pretty good if I leave my office silent for an hour or so. I need some kind of background noise. I’ve tried lots of things for background noise, to varying success. Things like podcasts tend to distract me into active listening, pulling me out of the task. Things like ambient music can lull me to sleep. I’ve had the most success with white noise and nature noise lately, but both of them seem to cause me to zone out every once in a while. This is the best background noise I’ve ever used. I turn it down so that the volume is pretty quiet – I can hear something that sounds like faint human activity, but it’s not loud enough to really distract me. It also keeps me feeling mentally active, something that I sometimes lose with other ambient noises. At least I now understand why I can sometimes get into a great productive zone in the back corner of the coffee shop here in town. The ambient noise is almost perfect for my mind. I’ve found that I’m almost always happiest in life when I know that I am fully in control of what I choose to be doing. Whenever I feel that someone else is making the choices for me and I’m just following what I’m expected to do, my happiness level falls through the floor. The challenging part is remembering that sometimes you made a choice that puts a bunch of automatic decisions in place. For example, my oldest son is playing in a higher-level soccer league than ever before this spring. It involves a lot of practices, surprising travel for road games, and many other commitments. I was involved in the choice to join this league, but now that the choice has been made, it feels as though other people are making the choice. Yet, I made the decision to commit to this soccer season, as well as the decision to become a parent at all. For me, happiness is often a matter of rolling back decisions and realizing that I did, in fact, make this choice and that, if I look at the big picture, the benefits outweigh the drawbacks. This video has been watched in our home more than a dozen times. Our children, especially our two older ones, requested that we watch this video several times in a row. It’s not just the subject being described here that I find amazing – although that’s very interesting in its own right. It’s how the video was executed. Something about it made the construction of a soda can so interesting and entertaining to my children that they wanted to watch it several times in a row. Why? How does this video engage them so well? What can I learn as a parent and as a content creator from that? I can’t help but notice the things that attract my children’s attention. Most of the time, it’s stuff that’s obviously tapping into the dreams or wishes or imaginations or the raw emotions of children. This doesn’t. It’s about the engineering of a soda can. Something really cool is happening here, and it’s not just the soda can. Eisenhower was not only our thirty-fourth president, but he was also a five star general in our military and the Supreme Commander of the Allied Forces in Europe during World War II. War has a cost. I think that society often overlooks the fact that every weapon made has a pretty big societal cost for our country, and every weapon used has a pretty big societal cost for the country we use it against. This isn’t to say that war is always the wrong choice, but I think that building big weapons and fighting enemies with bullets and guns and bombs and airplanes is often the easy answer and that the real costs of it are really easy to overlook. This is one of the best commencement speeches I’ve ever heard. Like any great commencement speech, it is not just inspiring to the graduates, but also to anyone who listens to the speech. Three elements really stuck out for me. First, change the lives of ten people. If everyone on Earth did this, the world would be a tremendously better place. Make this your life goal. Next, start your day properly and the rest will follow. If you start out your day in the first five or ten or fifteen minutes actively trying to do your best – doing things like making your bed perfectly, brushing your teeth as well as possible, and so on – you’re going to set a high standard for the day. The rest of your day is going to be excellent, too. Finally, you will fail and fail often and it’s the only way to get stronger. The Simple Dollar was my tenth (or so) attempt at creating a blog. It was the first one to gain an audience of more than a few hundred. The first nine were failures. They taught me many things, though, and with that knowledge and the willingness to try again, The Simple Dollar succeeded. One of the rites of spring in my life involves simply going out into the woods and looking in moist spots, preferably near dead elm trees, for morels. 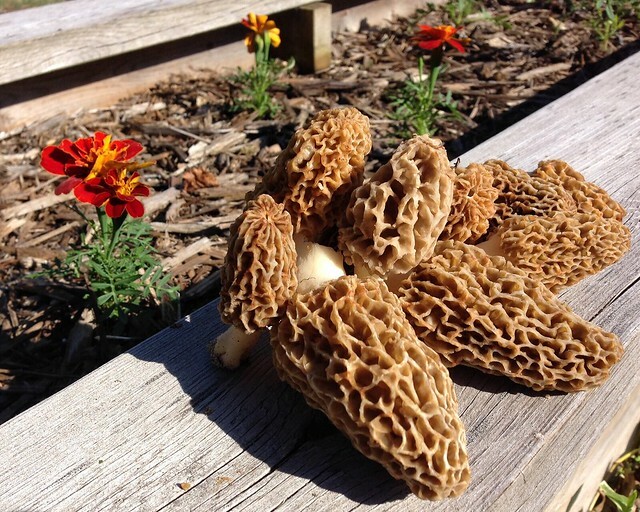 Morels are a delicious type of sac fungi that grow naturally in the woods in many different parts of the world, but have always been prevalent in the areas of the Midwest where I’ve lived. I’m not particularly good at finding them, I’ll admit. However, there are few things that feel more like spring to me than spending a few hours walking around in the woods, looking for fallen elms or other places that just feel “right,” and carefully examining the ground for these little yellow or light grey bundles of joy. I love to take them home, clean them, slice them in half lengthwise, soak them in salt water for about fifteen minutes, and then saute them in a bit of olive oil and minced garlic. I’ll often put them on top of pasta and have the best dinner of the year. Don’t let your life choices be dictated by what others tell you to do. When you do that, you become nothing more than a tool for them to achieve their own life goals. That’s not a bad thing if you care about that person and your own life goals have synergy with theirs – such as being a good spouse, a good parent, a good friend, or a good business partner. That’s part of having a good life. The problem comes when you let people that you barely know – or that you don’t even know – dictate your life plan. Do you buy things to impress people you don’t know? Do you do things to impress people you don’t know? Is that your life plan? What about bosses? When you do what they tell you to do, that’s part of an agreement to exchange some of your time and effort for money. That’s part of your life plan. It’s an interesting – and very useful – way to think about the choices in your life. 11. Walt Whitman – O Captain! My Captain! Whitman wrote this song eulogizing President Lincoln after Lincoln’s assassination. Lincoln passed away approximately 150 years ago, in April 1865. The world mourned his death. Our nation has perhaps never had a leader as great as Lincoln. I’ve found, over and over again, that the more secure that I am in my beliefs, the less actual fact and understanding that those beliefs are based on. This is true for political beliefs, personal beliefs, spiritual beliefs, and almost everything else I can name. The only way to make a belief truly strong is to doubt and to address those doubts and to be willing to abandon and change your beliefs if you learn, over time, that those beliefs are wrong or misguided. The only way to do that is to learn as much as possible from reliable sources and from lots of different points of view. It’s no different than a blacksmith honing a blade. A blacksmith will heat the metal to an incredible degree, then hammer it on all sides, then repeat and repeat, until the blade is incredibly strong. Sometimes, this hammering alters and bends the blade when a weak point is exposed, causing a new form to take hold. Knowledge and beliefs follow much the same pattern. We heat them by exposing them to new ideas, then we hammer them by asking questions and seeking out answers. Sometimes, those questions and answers reveal flaws in our beliefs, meaning that the belief has to be reformed. An ordinary swordsman believes his sword to be incredibly strong. A strong swordsman knows that his blade is quite weak.